Interesting video of “The First Flight of the Boeing 747 Superjet”. Words of wisdom. It's my New Year's resolution for 2019. I don't know who's number one, but I know that Iran Air is missing. And Iran Air was a launch customer who signed up days after PanAm IIRC and got early -100s, before later getting -200s and -SPs, shortly before the revolution in the country. By that last photo, I would say number 15 or 26. But other people in that old thread say that 15 is BOAC and 26 is El-Al. Does anyone have the REAL list? The pilots steered the aircraft very gingerly. As young as I was, I remember thinking that even the pilots were having to acclimate themselves to the size of the aircraft, and were extra careful as they nosed into the gate area. My dad pointed out the reflection in the cockpit window of the ground guy guiding the plane in as the guy was standing on top of the terminal building. Within a year, my dad took me on a business trip to California and I flew my first 747, a TWA 747-131 on flight 903, JFK-LAX. I can still remember taxiing in at LAX, and seeing TWA's over-the-wing jetway that connected to door 4L. The Queen broke the mold for all airplanes yet to come. El Al...as most airlines...introduced a new uniform around the time of the 747. I have a great picture of the first El Al 747 crew meeting with Golda Meir in their hip new uniforms. Having been fortunate enough to sit in various seats in the "nose" I think the 747 is one aircraft where seat 1A isn't the best. You are very close to 1K on BA, 2A or K are much better. Virgin is also very close in the first row. SAA's SP used to be great with the small cabin upstairs for first. The 747 is just so very special, especially in the nose or upstairs in J. Boeing's finest achievement, it transformed aviation for the everyday traveller and recreated the special era of the luxury of its predecessor the Boeing 377. Two things I heard from an old-timer at Boeing about the 747. 1) The factory was still being built when the first 747 was rolled out. While such a statement can easily connotate images of steel beams being lifted into place around the aircraft, one does have to remember the Everett facility is immense, and they were most likely working on adjacent bays. 2) Many of the employees working at the time (mid 60s) on the 747 project were from out of state. Boeing initiated the long December holiday break (paid) so they could visit their families. Not sure if they still have that benefit at Boeing, but it was still there in the mid 90's. It's always recognisable, it's an icon. Yes, to the point of becoming, even in the most primitive line-drawing form, the very symbol of aviation. For example, border crossing stamps of Schengen countries, for arrival/departure via airports, feature a mark that is unmistakably an outline of an airliner with a very characteristic hump, a 747.
walking thru RA001 an the Museum of Flight in SEA couple years ago. She's been repainted and restored to her former glory and looks great. Too bad Joe Sutter didn't live long enough to see the 50th anniversary. I remember when I was in around 4th or 5th grade at the time while I was outside on the playground everyone stopped and looked up as a big and beautiful Delta 747-400 that flew over my elementary school. Everyone just stopped in shock and awe because it was huge and the fact that it had 4 engines, as well as that ionic hump at the front of the plane. A few years later, last week on a Tuesday afternoon after my college classes, I had gotten a chance to visit the Delta Museum of Flight to see the plane myself in person. I have a video on my channel for anyone who wants to watch and will put a link below my message, but all I have to say it was absolutely amazing and stunning to be right beside the 747 and look at the sheer size of it, as well experiencing the cabin. I might not be able to get a chance to fly on the 747-400 in my life, but there are plenty of 747-8i aircraft that will be around for a bit and that is definitely on my bucket list when I travel soon! Hartsfield Jackson International has gotten quite a few 747 routes over the years, but I was so happy when Korean Air brought back their 747-8i and Virgin Atlantic will bring their 747-400 here starting on the 9th of this month and throughout 2019, and I cannot wait to spot them whenever I get a chance to. The 747 maybe fading in the future, but it will always be the greatest looking aircraft out there, and I really hope I can experience flying on one soon! As a kid I was taken out to Mascot airport to look at the first QF 747. Friends of ours worked for Qantas. I remember walking down the aisle to look out on the wing - it seemed to go on forever. Then, many years later, I was back on the same aircraft, except this time it was in CO colours and I was despatching the aircraft. CO acquired it after the take over of PE. The 747 has been part of my life for so many years. I've flown on BA, QF, NZ, TG, SQ, CO - not as many as I'd liked. Nothing seems as good since the VC10. Are you sure about both 13 and 16 being Pan Am? 16 clearly looks like their 1960's uniform but 13 looks like some other uniform entirely, and not the 1970 brown Pan Am uniform. I have forty (40) 747 flights to date, the first three being Northwest Orient 747-100 and the most recent the 747-8i of Air China and Lufthansa. Like so many aviation enthusiasts the 747 captured my imagination and wonder from early in life, and I have been lucky to fly on so many gorgeous Jumbos. That shortened hump on the -100 and -200 remain the sexiest feature in aviation, and their immense size make watching them waddle around the tarmac a sheer joy. And for anyone who hasn't flown on a 747, it can best be described as flying on a big, fluffy, teddy bear of a plane. The very first time I saw a 747 was in January of 1976 came over to Melbourne on a holiday from Hobart to stay with my grand parents with my cousin, I remember seeing a British Airways 747 parked over at the freight terminal, could not believe seeing my first Jumbo Jet let alone British Airways, then saw up close a Qantas 747 parked at the gate we flew in on an Ansett Airlines 721 and I could not believe the size of the engine compared to the fuel truck I was only 11 at the time and coming from Hobart back in the 70s we had never seen any thing that big before My family moved to Melbourne in 1977 we were always out at the airport seeing friends come and go, so got to see a few 747s at Melbourne. In 1978 first SQ 742 I saw had the "California here we come" stickers on the side that when they were just starting up the West Coast US services. Been on a few 747s in my life time. First trip to the US over Christmas 1982/83 Air New Zealand 742 SYD AKL NAN HON LAX the MELB to SYD sector was on the TAA A300. 1985 SQ 742 MELB-SIN-ABU-London Heathrow. They are all the flights I have been on the mighty Queen of the sky's Truly a magnificent aircraft. Today at Melbourne we only see Qantas now operate px versions out of Melbourne, CX bring in their 748f and SQ bring their 744F and so does Polar but you only see them at night, today Sydney is the airport if you still want to see 747s. I saw the 747 with the space shuttle on top fly by in Houston in 1984. Pretty spectacular. Were the SUD models retro-fit only or were they originally built like that? Was there a -300 or -400 Convertible? What a coincidence! I lived in Brunei for almost 5 years in the early 90's (1989-1994). With The Netherlands being my home country the same story goes for me flying BWN-AMS usually through SIN and sometimes KUL. After the 2 hour hop from Brunei to Singapore we continued with either KL or SQ 747. (-300 and -400 series). On long haul the Queen of the Skies was the only was to go in those days. And I absolutely loved to fly on them. Especially the -400 as I loved those winglets. I still think the -400 is the best looking 747. Sad to see them being phased out and the 8i not being succesful. Oh well, LH, KE and CA will have the 747 flying for quite some years I suppose. My best memory flying the 747 must be with SQ flying SIN-SFO with a stopover at Hong Kong Kai Tak. Take off and landing flying between the skyscrapers of Hong Kong with those massive wings was simply spectacular. Yes, there was a alternative with BI. To get from BWN to AMS with their 767 was quite a trip though. Back then you'd fly BWN-FRA with two stops at BKK (Don Mueang) and DXB. The last stage FRA-AMS was served by LH or KL. The above two were last August, and as a typhoon had just passed overnight at KIX, all KE morning flights from KIX were cancelled. We were originally scheduled on the midday 77E to ICN, but it was subbed out with the 747-400. I was ecstatic when I saw her arriving on Flightradar, knowing it would be my first 744 journey in nearly a decade. The flight to ICN was painfully short. I was born 1993, so our time in Brunei doesn't overlap much! I imagine you were in the Panaga area? There was precious little aviation around there, and even BWN rarely had planes, which is probably what has fuelled my passion later! I think I've only managed to fly on 744s, but I agree, they are the best-looking 747s! While I have too many 747 memories to mention I particularly enjoyed flying in Business Class twice, once with SQ (BKK-SIN) and BA (SIN-LHR), very glamorous for me! We only flew BWN-DXB-LHR once, when we left in 2004. BI didn't have a stellar reputation for punctuality, and we avoided them except for short hops to SIN, KUL or BKI. I have heard they've improved, though. Were the SUD models retro-fit only or were they originally built like that? Pretty sure they were retrofit only. Was there a -300 or -400 Convertible? I had the privilege of walking through one of the first (perhaps the second?) 747-121s, which was undergoing tests in Roswell, NM, before certification. So, it was, perhaps 1968 or 1969? Although it had Pan Am markings, there was no interior cabin, just random seats and lots of machinery (computers of some sort, I suppose) to measure performance. I even got to walk through the cockpit. I was awed and smitten by that beautiful jumbo. I loved how gracefully they took to the sky. SFO-JFK TWA 2001. Just days before the AA buyout. He did pretty darn well though, lived to be 95. I saw him speak a few years before he passed. Very inspirational. I believe TWA retired their last 747 in 1998. Pretty sure none were left in 2001. Good job putting this list together. Only other model that probably comes close to number of variants is the DC-8. Don’t forget the 747 has the Air Force 1 variants too. Add VC-25A and VC-25B to the list too. Many memorable flights for me also. First was 1973 (PanAm) last was maybe a couple years ago (LH 748) Most memorable? Avianca BOG-JFK. (Leased from SAS I think). Sat behind the captain in the jump seat most of the way including the landing via the Canarsie approach. Sublime. A bunch of KLM combi flights too. Race horses in the back! That must have been a remarkable experience, especially with it being the first widebody and SO much bigger than anything else at the time. I remember seeing it for the first time at age 11 when it was on a media tour at LAX. Amazing sight it was. I've since only flown on her twice. Air France L.A. to Paris in 1984 and 1988. Yes, I lived in the Shell camp in the Panaga area. The traffic at BWN consistent of RBA's 757 and 767 aircraft and the daily flights by SQ, MH and PR. To get out of Brunei you'd most likely had a stopover at Singapore Changi. I always enjoyed being there. Amazing airport and home of probably my favorite 747. The Mega top! As SQ used to call these 744's. And of course, being from The Netherlands, the very recognizable blue KLM 747's were special to me as well. In 1996 flew in QF 747-300's MEL-AKL-LAX and back, then 1998 in a CX 747-300 HKG-LHR (2 weeks before Kai Tak closed) and 2004-2005 in QF 747-400's MEL-SIN-LHR-SIN-MEL twice. Last trip was in 2015 on a QF 747-400 LAX-MEL (the outbound flight MEL-LAX was my first trip in an A380). Nowadays the only 747's I see at home are the occasional SYD-JNB flight when they overfly Melbourne at FL390 and the weekly CX22 747-8F cargo flight SYD-MEL-WTB-HKG which I make a point of trying to spot on Tuesdays when it arrives into MEL. I disagree, the 747 is the only wide body where you and your partner can sit side by side, both with window seats. We did it a few years ago NAN/AKL in 1A/K just before NZ withdrew the 744 from service. I had planned it specifically for that unique seating arrangement. I told my wife to use her minds eye to observe us from the outside, sitting in the very nose of the plane, peel back the skin to look at us sitting in our Biz seats drinking a toast to the queen. I said it was akin (use imagination!) to Apollo astronauts sitting atop their fiery rocket! I love looking at the photo of me in the extreme nose, arms outstretched touching both sides of a wide body jet, only possible in the 747 !!! I am lucky enough to have flown 500 times + on 747's and have flown on every variant bar the -8. I could go through my flight log book and count the exact number but it is at least 500 times. I vividly recall watching a British Movietone newsreel in the cinema in the early 70's and seeing the arrival of the first Pan Am flight into London Heathrow. The aircraft came into view from behind some buildings and there was an immediate series of gasps and expressions of wonder in the audience at its huge size, dwarfing everything around it! I remember my first flight on a 747-200 and being amazed at how wide it was and also the number of vertical surfaces in the cabin - galleys and toilets. I also recall being very impressed at how much the wings flexed on rotation and the springy ride it gave during turbulence. It was a joy to fly in - large, solid and comfortable and it will remain one of my favourite types. Missed a connection to Frankfurt in D.C. once and got put on one of the rarest passenger planes on Earth, the 748. It's a shame there won't be a thousand of those beauties plying the skies. Boeing launched the 747SUD program, when new 747 sales were very slow and the Boeing factory had excess capacity. KLM and UTA operated relatively new GE powered B747-200Bs. KLM also operated older 1971 P&W powered B747-206Bs, but these did not qualify for the program. KLM's GE powered -206M models operated with more powerful engines rated at 55.000lbs. These combi aircraft were the most powerful B747s at the time. 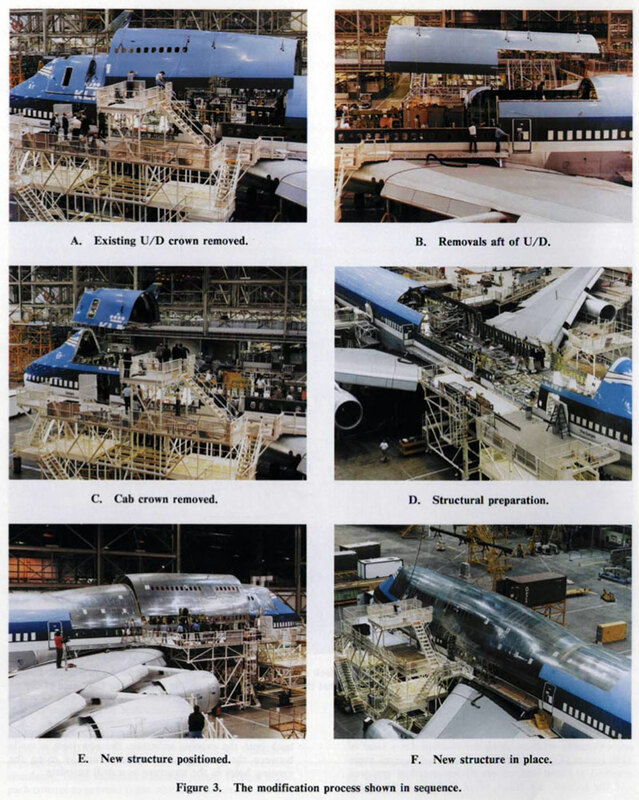 Only these later GE powered 747-200 aircraft qualified for the SUD PROGRAM. Earlier lower rated -200 aircraft did NOT qualify for the SUD program. So KLM and UTA sent their B747-200M one-by-one to the Boeing factory in Seattle to have the -200 roof removed and replaced by the Stretched Upper Deck = SUD. My favorite memory of the 747 happened in Cocoa Beach, FL. My wife and I were laying on the beach when the shuttle carrier (former AA 747-100, N905NA) made two low passes just off the beach. I don't remember which orbiter was on top, but it was being ferried back from Edwards AFB in CA. Sometimes being a KSC NASA contractor provides you with unique life experiences you just don't forget. All in all, 30 flights, 15% of my almost 200 flights yet, but more than a third of the distance I've flown. I planned my entire Europe trip last year around getting on one of these into Frankfurt. I even sprung for business class and knocked another item off my bucket list by flying in the upper deck. And I TOTALLY agree that it is a shame to not have thousands of these beautiful birds in the sky flying passengers, but we get to say now and forever we flew on one of these! Flew SFO-HKG-SIN via SQ in coach, with a fuel stop in TPE. My first flight on the Queen was also during my first time being off the mainland United States. December 173, my mother and I visited a friend in Puerto Rico. We were living in Urbana, IL at the time while my mother was in graduate school at the University of Illinois. We bused up to Chicago (good things, as Champaign-Urbana was hit by 15" of snow two days before we left, so I suspect little if anything was moving out of CMI at that time). Flew an EA L-1011 (my first widebody flight) ORD-SJU, then after staying a few times, we were flying to New York to visit my grandmother. Our bird was an AA 747-123. I took a pic of it in the terminal before boarding, I think that was my first ever aviation pic. Of course, the top of the hump extended above the window of the terminal, but you could see it was a 747. We were in coach, so no visit to the hump, but AA did have a piano bar at the rear which I saw. After that, flew a couple of TW 747s on a JFK-LAX-JFK trip in late March/early April of 1975. The outbound had a technical stop at MCI for 5 (!) hours due to an engine problem (it's never a good thing when a F/A comes over and asks if you see smoke coming from the engine (it was the #3 engine). So we landed at MCI. The cabin crew was great. We had already eaten and they had been showing the movie. They had to stop the movie to land, but once parked at the gate, they resumed playing the movie, as the technicnans worked on. At some point, they invited us in steerage to come up and tour the upper level, which I did (only time I've been up top on a 747). Don't remember if they letter folks peek into the cockpit. After awhile, they let people who wanted to do so deplane in search of food, but the consessions were sold out! (obviously, MCI usually didn't get a 747 in revenue service dropping by, even though that was TW's maintenance base. At some point, they were thinking of getting two planes to take everyone to LAX (2 707s? 1 707 and a 727. Maybe even an L-1011?) Finally, they got it fixed and we were on our way. The flight had departed JFK at 12:00 Noon, with the time difference, scheduled arrival at LAX was around 2:30 PM. We arrived at LAX at 9:00 PM PST. So 12 hours total on a plane. The flight back was uneventful, that 747 had been repainted into the 1974 livery. We departed in a pouring rain, I later found out that it was the last time it rained in L. A. until the following January (L A was in the midst of a multi-year drought).